Southern Africa is not all about safaris. The southern tip of the African continent is home to some of the best beaches in the world as well as some of the most interesting wildlife. And indeed, some of the most stunning creatures to inhabit this part of the world are to be found swimming along the coast in some of the world’s most pristine waters. So, step outside of your safari lodge and discover Southern Africa’s top coastal activities. This is the other side of Namibia and South Africa away from safari tracks and offering a choice of unique activities and day trips that will colour any holiday: from whale watching in Hermanus to lounging on sandy beaches in Cape Town. The chance to experience life in the vicinity of great white sharks, dolphins, seals, manta rays, penguins and thousands of other fish species are themselves just a small part of the amazing encounters visitors will have the chance to experience whilst indulging in day trips in South Africa and beyond. The Skeleton Coast – named after whale and seal bones washing up from the sea as well as shipwrecks in the area in more modern times – and the charming towns of Swakopmund and Walvis are home to some exciting coastal experiences. The chance to encounter local dolphin populations and other marine life is a must for this area but away from the flora and fauna it has to offer, activities like quad bike rides in the dunes of Swakopmund, paragliding over Namibian desert or canoeing on the coast are popular pastimes too. Walvis Bay is located where the desert plunges into the ocean below, making it a unique setting to impress any traveller visiting Namibia. It is at the heart of this natural site that boats depart from Walvis Bay Yacht Club for an amazing cruise along the coast to meet dolphins and seals as well as taking in the African coastal vistas. In terms of wildlife encounters, diversity of sightings and scenery, this is one of the best dolphin cruises Namibia has to offer. Your half day cruise first heads towards the trawlers anchored along the coast where individual sea lions come to beg for fish from cruise ships hoping to be thrown a treat. Whilst sailing in the bay, these boats are also followed by dolphins playing along behind in the waves, making the chances of a close encounter great. Once you reach Pelican Point, at the tip of the peninsula, you’ll discover a colony of Cape seals. These sea lions can be seen both on the beach and in the water. With a little luck, after the earlier boat ride, dolphins can be seen hunting fish in the area. In addition to sea lions and dolphins, Walvis Bay is inhabited by numerous species of birds such as pelicans and flamingos making this trip a unique way to discover the local wildlife without ever setting foot in a safari park. There are plenty of amazing activities to enjoy in Namibia and here are some of the other great things to do when visiting this coastline. This is one of the activities to indulge in around the Swakopmund area. Excursions are available and will usually meet in Walvis Bay, about 30 minutes travel time from Swakopmund in a 4WD drive vehicle between Walvis Bay and Pelican Point. It is here that visitors will discover the huge lagoon which is home to large populations of animal life. It is estimated that there are as many as 10,000 sea ​​lions but away from the marine life, there are also jackals stalking the area looking for a treat as well as flamingos and pelicans to be spotted as well. After arriving on site it will be time to get geared up and start to paddle out on the water to meet these incredible animals. Trips are usually involve 1 to 2 hours of kayaking on the lagoon and travellers can spot the whole colony of sea lions. Don’t try to count them – it is impossible! Some sea lions are so curious and playful that they come to swim and dive next to the kayaks and to play with the paddles, too. After kayaking, it is time to head back to the truck and drive back to Walvis Bay after a barely-believable day of wildlife encounters. This is a spectacular day trip along the Namibian coast, taking travellers to one of the most inaccessible points on the coastline in the heart of a breathtaking natural setting. Sandwich Harbour tours are another incredible experience to add to your Namibia holiday. Located where the desert and the impressive dunes dive into the tempestuous and majestic Atlantic Ocean, it is beaten by the winds and the waves and makes for a rugged sight with more chances to meet the local wildlife. 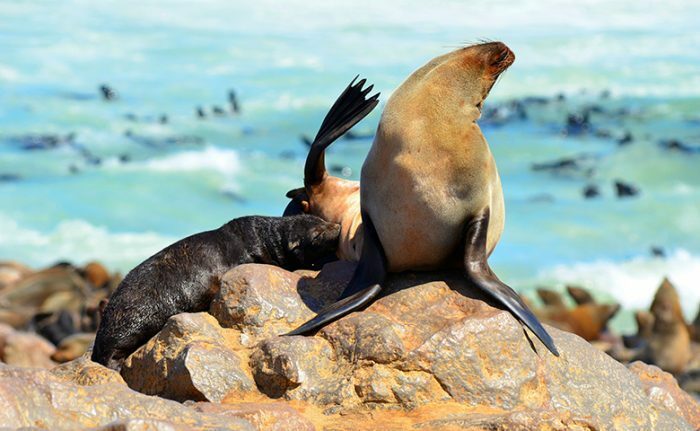 Your day trip starts with a cruise, departing from the port of Walvis Bay to observe pelicans and perhaps encounter whales, dolphins and sea lions during the crossing. Next up is your 4WD activity to the Sandwich Harbour site, a natural site protected by the world’s leading environmental protection organizations. It is a beautiful dune site of ivory and gold colours and one that the local fauna has chosen as a breeding ground. Guides take visitors through the high dunes in 4WD vehicles, before heading for a walk along the beach where the sea and dunes meet. Then, head to the very site of Sandwich Harbour itself – an incredible place, where you can climb to the top of the dune to contemplate the beautiful view of the lagoon, the sea, the dunes and the flamingos in the distance. Namibia is a breathtaking place that safari goers already know as an underrated destination but what many don’t realise is the breadth of choice available in this nature-rich land. Discover more exciting things to do on your Namibia holiday now. Namibia’s neighbour to the south, South Africa, is also a land of many varied activities. A stay here, affords tourists the chance to enjoy activities as diverse as rafting, canyoning, horse riding, bungee jumping, scuba diving and snorkelling, caving and hot air ballooning – as well as numerous other excursions of all kinds! A nature-lover’s paradise as well as a feast for anyone who considers themselves an outdoor-type, it is also worth exploring the cultural side too. Discover the Zulu, Xhosa, Ndebele and Bapedi groups and – among other things – the rock art of the most ancient inhabitants of Southern Africa, typical African villages, weavings and regional markets, historic cities like Cape Town, Johannesburg or Pretoria, iconic and historic places like Robben Island Prison. And, of course, the wine-producing regions around the southern cape. Cape Town is an impressive city in its own right. Set on the coast and looking out over the Southern Atlantic ocean at one of the southernmost points of the African continent, it is a breathtaking place just to be. With great architecture, local wines, stunning beaches and the imposing Table Mountain, it really is an incredible holiday location. But one of Cape Town’s most amazing activities is its whale watching opportunities. The town of Hermanus is considered to be the whale watching capital of South Africa and one of the best spots in the world for this. It has some of the best whale watching Cape Town and the surrounding areas have to offer. A seaside resort just a few hours from Cape Town, Hermanus is a very pleasant harbour in its own right but also renowned for its whale watching site which has made it a very popular area. Visitors will also be able to see the whales around the peninsula and along the south coast, towards the cape. There, admire the whales and their calves cruising to the southern tip of Africa. 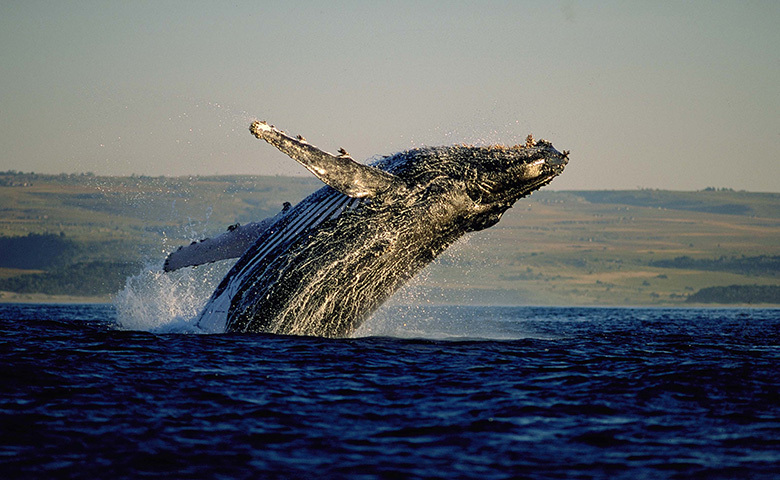 Discover out top Hermanus Whales Day Tour today. For those who wish to add an extra dose of excitement to their South African coastal tour, a day spent cage diving amongst the great white sharks is an impressive encounter and a once-in-a-lifetime experience. Take a boat tour out to Dyer Island that promises a meeting with the South African great white sharks in the depths of the ocean. The proximity of the giant predator inspecting your cage sends a rush of adrenaline throughout the body. Learn more about your Shark Cage Diving Day Tour now. If you are keen to enjoy the South Africa coast, enjoy a leisurely self drive that incorporates some of the top spots and see if you find wild penguins. Perhaps you will want to surf a few good morning waves in Muizenberg, before heading south and driving to Simon’s Town. This small town, nested on the shores of False Bay, is well known for the presence of a Cape Penguin colony on Boulders Beach. These small animals are not so wild and it is very easy to approach and swim nearby in the beautiful setting. After Boulders Beach, head south along the coast towards the Cape of Good Hope and Cape Point. This is a large natural reserve, where visitors will cross the path of several interesting animal species. Contrary to what most people think, this is not the most southern point of Africa, the latter being the Cape of Needles a little further east. This place remains grandiose nonetheless and in the area there is a large population of local fauna: zebras, antelopes, ostriches and baboons. After marvelling in front of Cape Point, take the road back north but this time along the west coast and therefore to the Atlantic Ocean – all the way to Noordhoek at Chapman’s Peak Road. This coastal road is considered one of the most beautiful roads in the world and is home to some spectacular geological features. Chapman’s Peak Road leads to the town of Hout Bay. The day will probably be well advanced by the time you arrive, though, and it will be time to rest a bit with a drink in one of the bars along the harbour and replenish with some of the best Fish and Chips in South Africa! Try the self drive itinerary above with South Africa Car Hire or explore with a well laid plan with our Western Cape Wanderer Self Drive Itinerary. 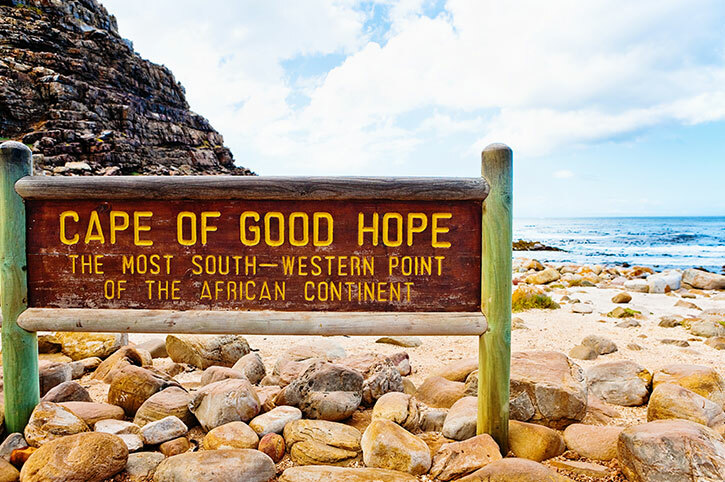 If you don’t fancy a self drive from Cape Town to the Cape of Good Hope, or only have a day to spare, book a Cape of Good Hope Day Tour instead. With some of the most pristine sandy beaches in the world, Mozambique is another southern African country with much more than safaris to offer its visitors. 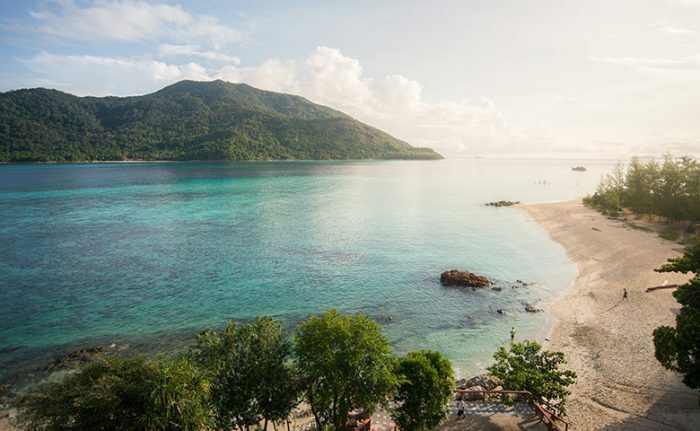 Take time out to find a secluded resort on the beach for a few days of relaxation. Enjoy the water sports such as snorkelling, diving, and even some great surfing spots nearby. Or just sit back and sip a cocktail under the shade of coconut tree making the most of Mozambican life. Although dolphin habits are well-known, like all wild animals, they are still often found doing unexpected things and there is always an element of luck necessary in order to spot dolphins. The way they interact with humans will also change based on their mood. Indeed, when dolphins are accompanied by their babies, they prefer to stay away from the boats. Encounters with them are always magical moments but a trip at Ponto Do Ouro is still worth taking even if you don’t meet with these incredible creatures. The coast here is spectacular and to see it from the sea on a boat is definately notable as is a trip to the pretty little town of Ponta. During the cruise, choose to spend some time snorkelling to discover and admire the beautiful reefs that make Ponta Do Ouro a popular destination for scuba divers. The Mozambique Channel, south of Maputo, offers warm waters and a very rich diversity of underwater life. Dolphins, whales, turtles and manta rays all call this area home but there is also the aforementioned array of coral reefs to be found too. 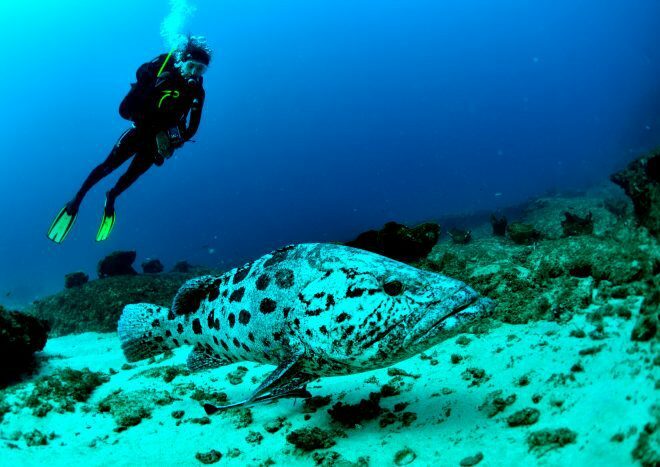 Ponta has very rich waters and is a treat for diving enthusiasts as well as beginner snorkelers. On your holiday in South Africa and its neighbouring countries, don’t forget to make some time to enjoy the coast and its incredible wildlife. Chill on the pristine sandy beaches with a cocktail, bathe in the incredible warm waters and go on thrilling adventures and encounters. The African coast certainly has something for everyone, from the penguins at the Cape of Good Hope to cage diving with sharks! Add Southern Africa’s top coastal activities to your Africa holiday.